Here my focus is on indicating why it is an essential component of an effective learning environment, and to describe briefly some of the main activities associated with learner support. above all challenging students to go beyond their current level of thinking or practice to acquire deeper understanding or a higher level of competency. These activities normally take the form of personal interventions and communication between an instructor and an individual or a group of students, in face-to-face contexts or online. These activities tend not to be pre-planned, requiring a good deal of spontaneity and responsiveness on the part of the teacher or instructor. Scaffolding is usually a means of individualising the learning, enabling student differences in learning to be better accommodated as they occur. This could be seen as a sub-category of scaffolding, but it covers the role of providing feedback on student performance of activities such as writing assignments, project work, creative activities, and other student activities beyond the current and perhaps future scope of automated computer feedback. Again, the instructor’s role here is to provide more individualisation of feedback to deal with more qualitatively assessed student activities, and may or may not be associated with formal assessment or grading. Good design can substantially reduce demand for learner support, by ensuring clarity and by building in appropriate learning activities. Students also vary enormously in their need for support in learning. Many lifelong learners, who have already been through a post-secondary education, have families, careers and a great deal of life experience, can be self-managed, autonomous learners, identifying what they need to learn and how best to do this. At the other extreme, there are students for whom the formal school system was a disaster, who lack basic learning skills or foundations, such as reading, writing and mathematical skills, and therefore lack confidence in learning. These will need a lot of support to succeed. However the vast majority of learners are somewhere in the middle of the spectrum, occasionally running into problems, unsure what standards are expected, and needing to know how they are doing. Indeed, there is a good deal of research that indicates that ‘instructor presence’ is associated with student success or failure in a course, at least in online learning. Where students feel the instructor is not present, both learner performance and completion rates decline. For such students, good, timely learner support is the difference between success and failure. It should be noted that the need for good learner support, and the ability to provide it, is not dependent on the medium of instruction. The kind of credit online courses that have been designed and delivered long before MOOCs came along often provided high levels of learner support, through having a strong instructor presence and careful design to ensure students were supported. At the same time, although computer programs can go some way to providing learner support, many of the most important functions of learner support associated with high-level conceptual learning and skills development still need to be provided by an expert teacher or instructor, whether present or at a distance. Furthermore, this kind of learner support is difficult to scale up, as it tends to be relatively labour intensive and requires instructors with a deep level of knowledge within the subject area. Thus, the need to provide adequate levels of learner support cannot just be wished away, if we are to achieve successful learning on a large scale. This may seem obvious to teachers, but the importance of learner support for student success is not always recognised or appreciated, as can be seen from the design of many MOOCs, and the reaction of politicians and the media to the cost savings promised by MOOCs, which are entirely a function of eliminating learner support. There are also different attitudes from instructors and institutions towards the need for learner support. Some faculty may believe that ‘It’s my job to instruct and yours to learn’; in other words, once students are presented with the necessary content through lectures or reading, the rest is up to them. Nevertheless, the reality is that in any system with a wide diversity of students, as is so common today, teachers and instructors will have to provide effective learner support, unless we are willing to sacrifice the future of many thousands of learners. Do you think it is possible to design an effective course or program without the need for high levels of learner support? If so, what would it look like? A development of MOOCs or something completely different? Do you share my views about the limitations of computers for providing the kind of high-level learner support needed for conceptual learning in a digital age? 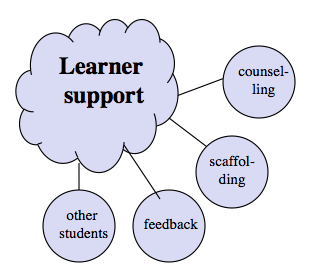 What do they do well in terms of supporting learners? 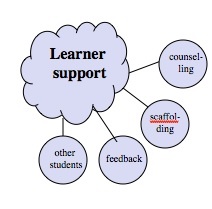 Is ‘scaffolding’ the best term to describe the kind of learning support I described in that section? If not is there a better term for this? Write your answers in the comment section at the end of this chapter. A.6 Learner support by Anthony William (Tony) Bates is licensed under a Creative Commons Attribution-NonCommercial 4.0 International License, except where otherwise noted.